Motivation and Productivity go hand in hand. We all have our own tricks to stay motivated and increase productivity. Some people have to listen to music while they work and others need complete silence. I've found I'm at my most productive when I write 3-6 goals to accomplish each morning. These goals may be smaller chunks of a larger project. I've been using the Pomodoro Technique for the past year and it has really helped with motivation and productivity. The idea of the Pomodoro is for short bursts of work. You work uninterruptedly on one task for 25 minutes and then you get a 5 minute break. After 4 bursts, you get a 15 minute break. So out of 130 minutes, 100 were spent focused on specific tasks. It also helps limits distractions. The sound of the audible timer is key. It reminds you of what you need to be doing and helps coworkers know that you're focused on work. If you don't feel like buying a manual timer that sits on your desk, you can always use the FREE Tomighty app. Spending 8 hours a day on a computer leads to obesity and unhealthiness. There have been many reports on the dangers of sedentary behavior and the effects of sitting all day. NPR had a great story on how sitting is worse than we think. 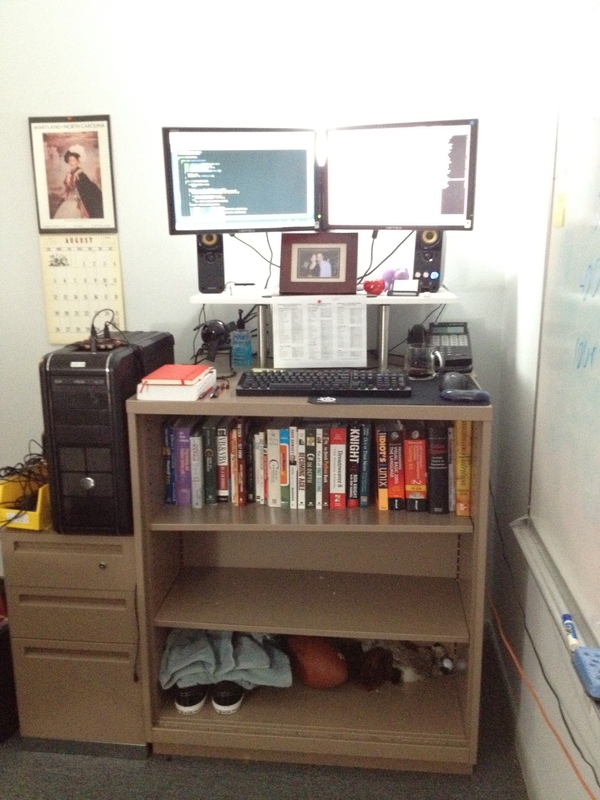 My office fortunately allowed me to create a stand up desk out of spare office parts. I also have a chair that raises high enough so I can alternate between the two. If you're unable to create your own stand up desk at work, it helps to get up and move around every 30 minutes. The Pomodoro Technique allows for a 5 minute break of moving around every 30 minutes. If you are standing, find a good anti-fatigue mat and be sure to have a comfortable pair of shoes in case your feet get tired. The first week of standing is usually the toughest as your body gets used to supporting your weight for multiple hours. It's worth it.